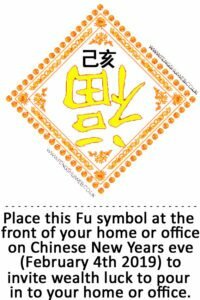 Fu means good luck and the reason that the character is placed upside down is that it is believed that that by placing it upside down will cause the good fortune to literally pour out on the home, office or building in which it is placed. Upside down Good Fortune signs are very similar to Chinese New Year Couplets and are made with red paper for the background and bright gold or black paper for the Chinese character which is carefully cut out to create a beautiful design which has a big red diamond (not a diamond as you would see on a ring but a square which is turned 45 degrees on the paper designs and in bright gold or black paper, you will find an upside down Chinese Character which is 福 (fú /foo) on or over a door to a home, office or building. This fascinating tradition that has been around for many years may have actually come about from simple mistake! 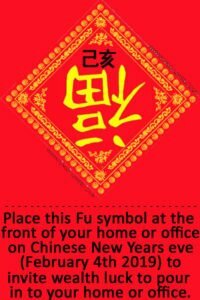 I couldn’t find any information on the exact date but during one Chinese New Year, a family in China placed the 福 (fú /foo) symbol on the diamond upside down as a mistake and without realising, they placed it on the front of their home. 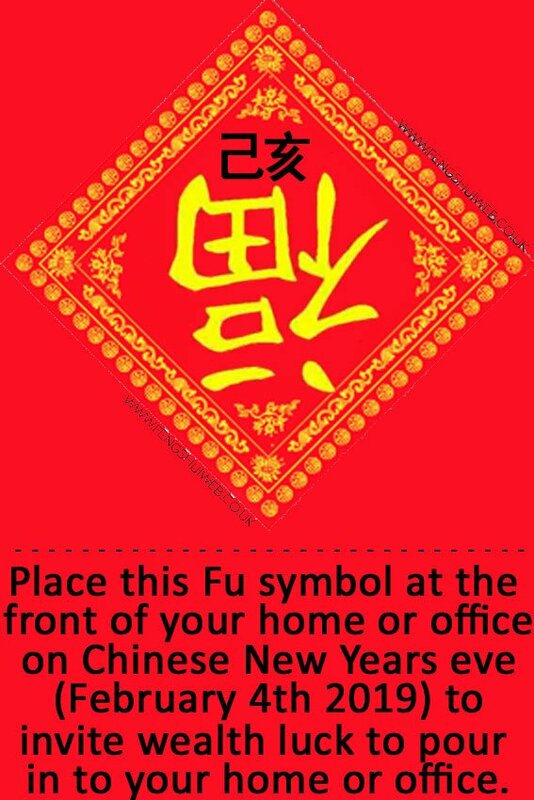 The family had now placed the sign up and on the first day of Chinese New Year when people came to their home and saw the sign with the upside down Fu symbol, they would say to them “你们的福倒了!” which means ‘Your fu is upside down!’. 倒 (dao /daoww/) means ‘to invert’ which can also be translated as “To pour out” which started the tradition of having the Fu symbol upside down as it would be read as “having your blessing poured out on your home”. 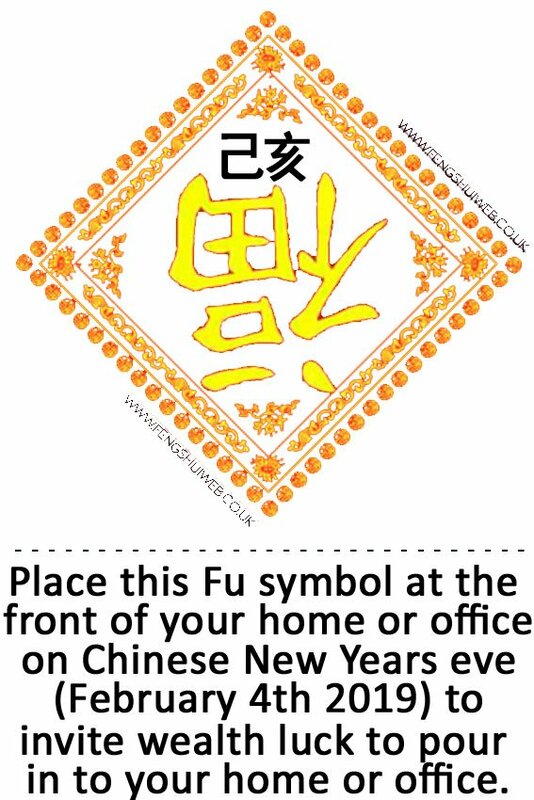 This year, we have designed a Fu sign for you to download for free to place outside your home or office on Chinese New Year’s eve and you should leave this up until the day after Chinese New Year’s Day. For more information on Chinese New Year 2019, year of the Yin Earth Pig you can take a look at the links below. We are more than happy to share our content; all you need to do is give us credit for our hard work and a link back to our website. You can download and save a printer-friendly PDF file that can be emailed or use any of the vast amounts of share buttons on the website, the more you share the better the Karma…! Where to hang for this year 2019? Which direction is the best place to hang the spring festival couplets? These should be hung outside the front door either on the door or above. Best directions to hang Spring Festivals couplets? I would place the couplets either side of the front door for Chinese New Year. Does it have to be down by the 17th? Ideally, they should be removed on the 17th although if you wanted to keep them up, you could place it in the southeast or northeast for the year.